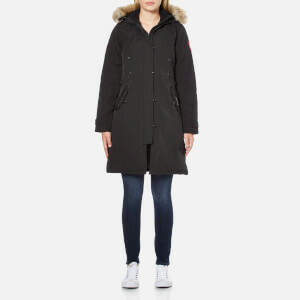 The Canada Goose 'Kinley' parka has down-filled insulation to offer optimal protection and coverage in cold temperatures. Inspired by the rugged ‘Kensington’ design, the black parka has been updated with a cinched waist and a snorkel hood to trap warmth close to the body. 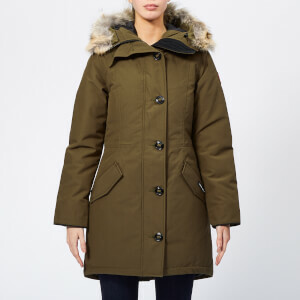 The down-filled parka is cut for a slim fit and falls to mid-thigh. 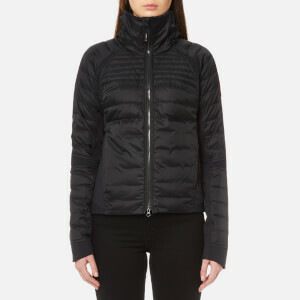 Fastened with a heavy duty two-way zip and a snap button placket to keep the elements out, the coat is crafted from Arctic Tech fabric to keep you warm and dry in extreme conditions. The parka coat is detailed with fleece-line handwarmer pockets with zipper closures and two snap fastened pockets. A tricot lined chin guard provides added comfort and protection from the cold when the parka is fully fastened. Interior backpack straps enable the jacket to be carried hands-free over the shoulders. Back vents with snap closures enable an increased range of movement when opened. 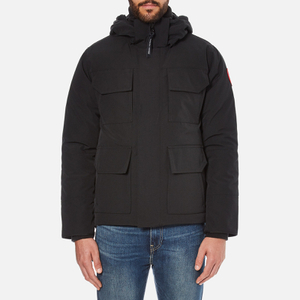 Complete with an embroidered Canada Goose patch on the sleeve, recessed rib-knit cuffs to lock in warmth and a zipped interior pocket. Outer: 85% Polyester, 15% Cotton 192GSM Arctic-Tech. Fill: 625 Duck Down.